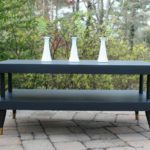 For the past few months I’ve joined a group of blogging friends who challenge each other to a monthly furniture makeover with a theme. 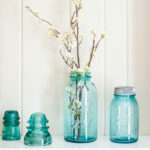 Since April showers bring May flowers, this month’s theme is flowers. 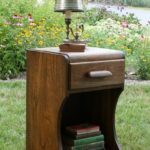 I love the challenge of making a piece of castoff furniture into something beautiful and functional. 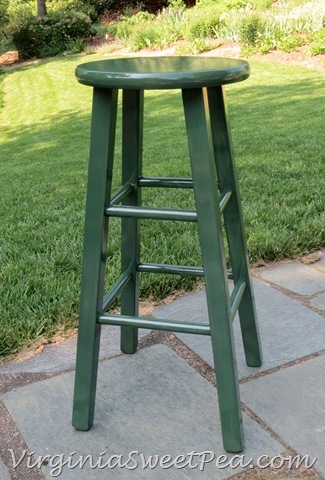 My mom gave me a bar stool from a rental cottage that she no longer needed. It’s been patiently waiting in my basement for its makeover and now it has happened. 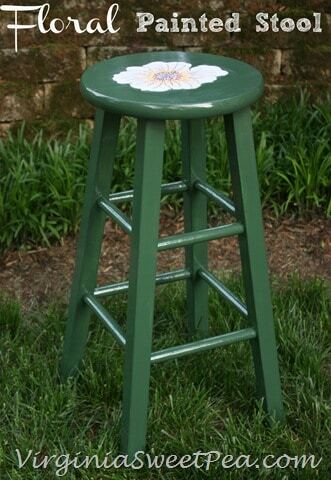 The once generic looking stool now sports a glossy coat of Martha Stewart Turkey Hill Green paint with a flower embellishing the top. 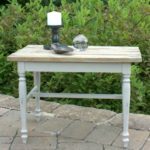 The stool’s life in the rental cottage was rough at times, so this project started with sanding the wood smooth. 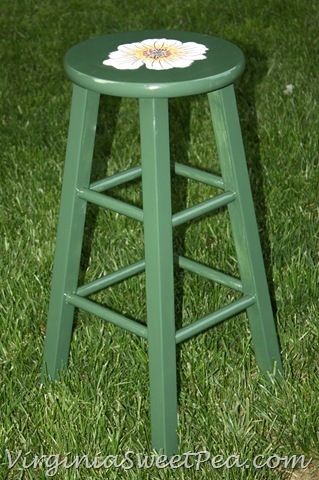 After sanding, the stool was painted with MS Turkey Hill Green paint. 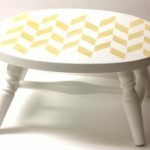 Suzanne, thrift shopper extraordinaire, found the paint at a local Goodwill for just $.95 and let me use it for this project. Although I love the end result, I would not recommend this paint as it took six coats to cover the surface and it’s still not perfect. 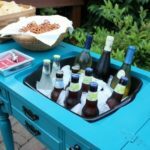 I intended to hand paint a flower on the top of the stool but changed my mind after thinking about the pretty flowers printed on the fabric that I used for my guest bathroom shower curtain and window valence. 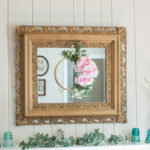 Since my artistic talent is quite limited, using a fabric flower was a much better option for me over hand painting one. A flower was cut from a scrap piece of fabric and Mod Podged into place. 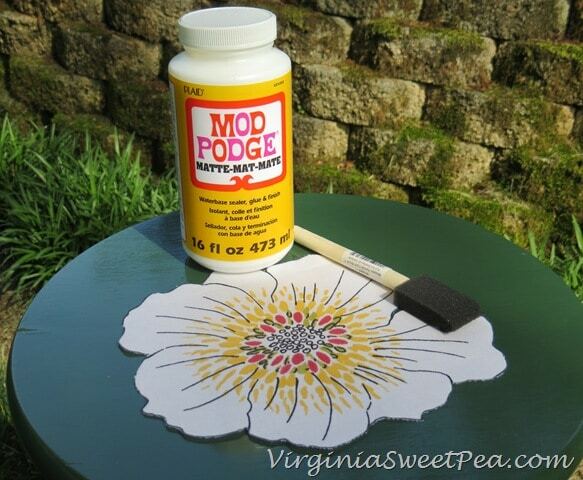 After the Mod Podge dried, a second coat of Mod Podge was applied over the flower to seal it into place. 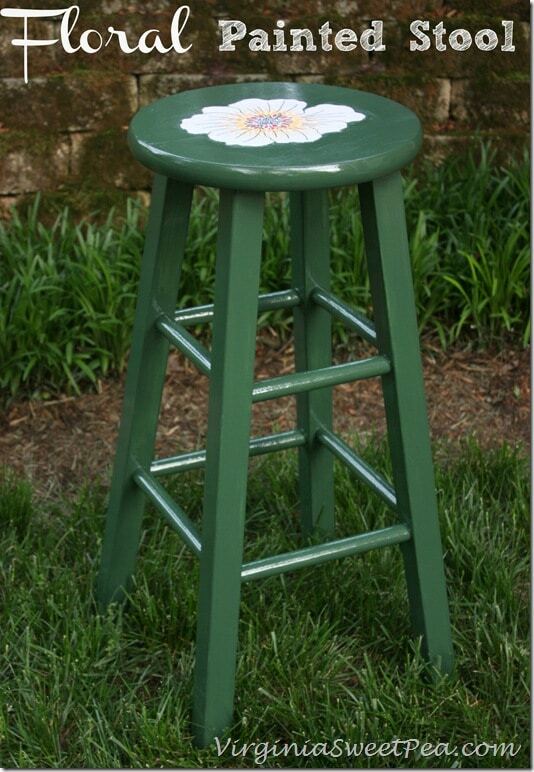 With the addition of paint and a pretty flower, this bar stool is now no longer drab. Joining my friends for a monthly paint challenge has been so much fun! March’s theme was metallic paint where I shared a trift store stool made over with white paint and a fun gold stencil. 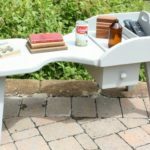 In April we chose bright paint colors and I made over our garden bench. 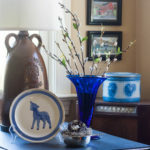 I am looking forward to finding out what the theme will be for the June challenge. 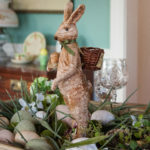 Please visit my friends who are also sharing their projects! While you are here, be sure to enter the $700 cash giveaway. 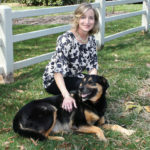 Previous Post: « Ready for the Beach $700 Giveaway! 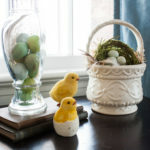 I love that you used a fabric flower to modge podge on your stool! Looks great! So happy to be touring with you, Paula! Really cute Paula. 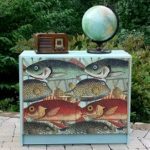 I like to decoupage too. I can’t draw at all. Love the green color too! What a gorgeous stool you have now Paula! I always love any shade of green and you picked a beauty. Lots of TLC you have that roughed up old stool but so worth it! 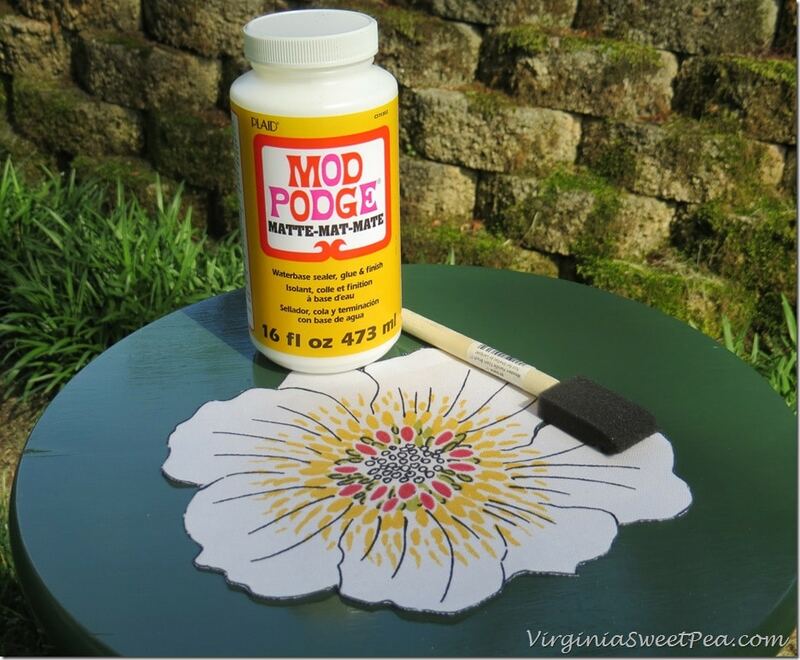 The Mod Podge flower makes a perfect topper! It looks great! From boring to beautiful! I love seeing your challenge results each month. 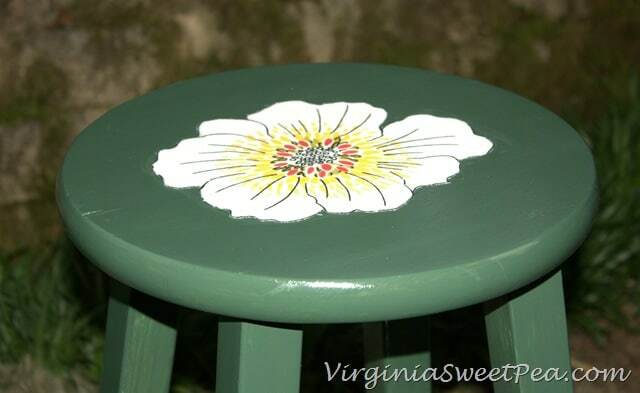 Your stool turned out so pretty and vibrant. I love that you used fabric you already had on hand. Such a smart lady you are. 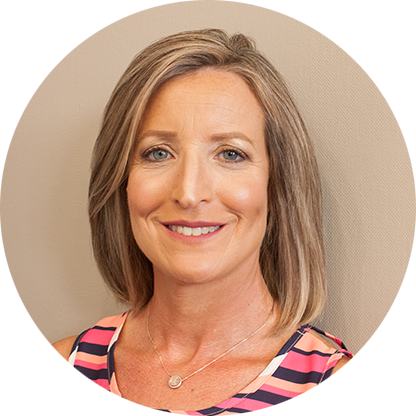 Paula, I love seeing your monthly makeovers! 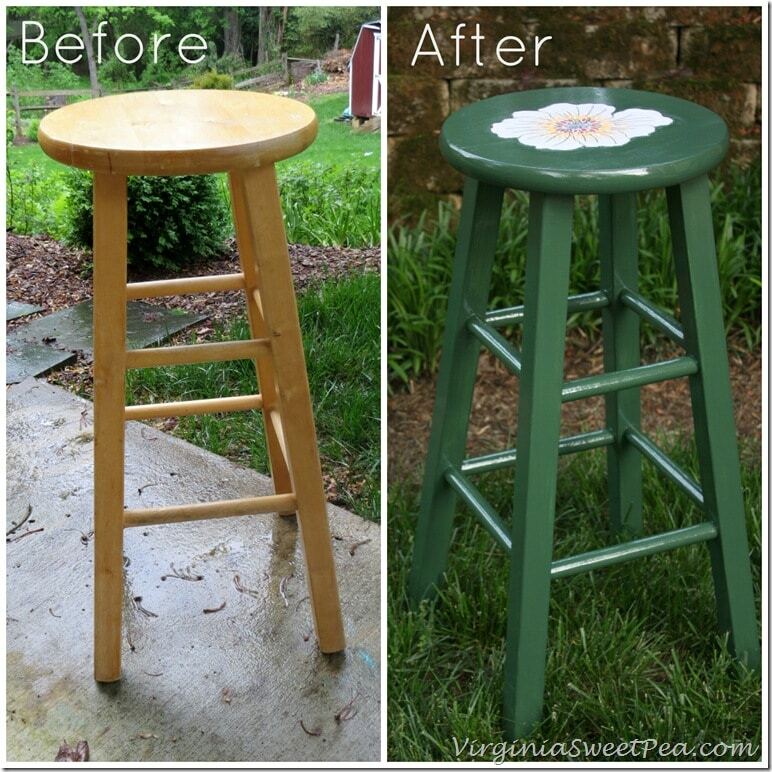 You are so creative and I am in love with your stool redo! The flower just pops and I would have never thought to do that. Great job! Thank you, Alli! I was so pleased with the end result of the makeover and think that this stool will be great in my classroom next year. This came out great! I love that you used fabric for the flower. What a great idea! 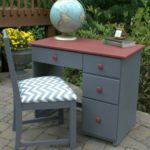 But I can’t believe that it took 6 coats of paint! That’s patience! I didn’t think I’d ever finish painting it! Once I was into it with a few coats, I felt like I might as well finish even though I had no idea how many it would take to get the job done. Thanks, Christy. 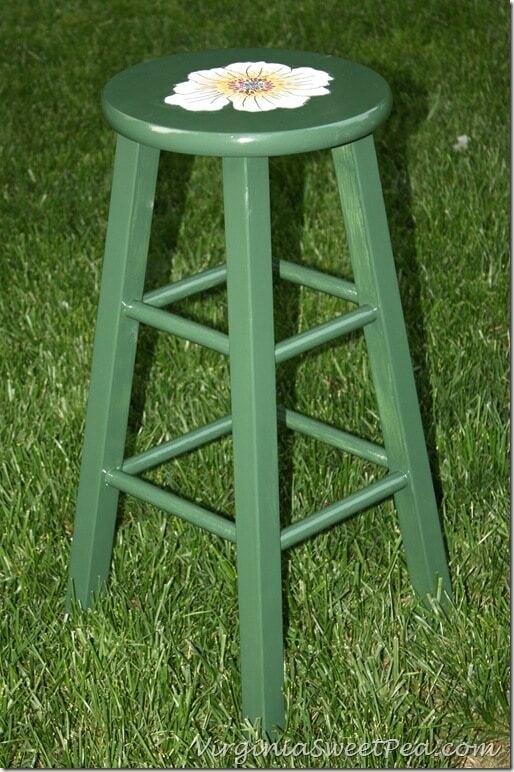 I thought I’d never finish painting that stool but I’ll have to say that now that it’s finished, I really like it. These turned out beautifully! Great job! Thanks for joining the Monday Funday Party!